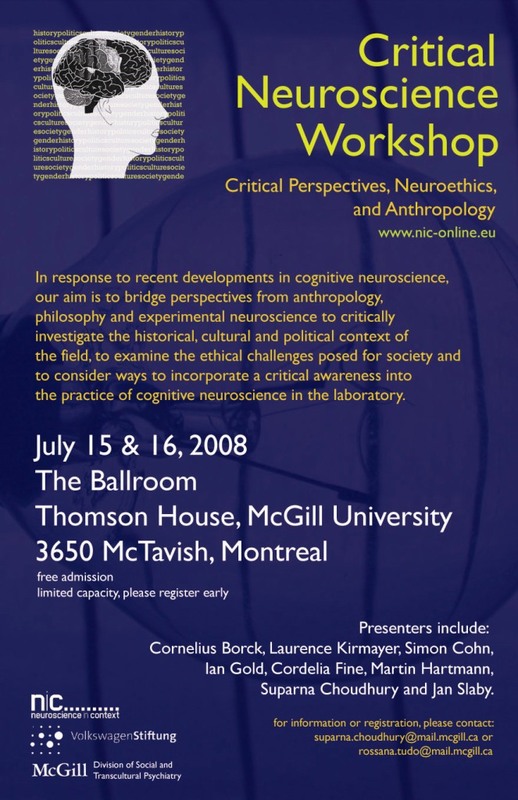 Next month I will attend the Critical Neurosciences Workshop on “critical perspectives, neurosciences, and anthropology” in Montreal. I’ll help run a discussion on the “cultural brain,” along with Suparna Choudhury, the main organizer. The workshop is being sponsored by Neuroscience in Context, a European group, and by McGill’s Division of Social and Transcultural Psychiatry. Given the quality of both organizations, I can say that I am excited to be a part of this workshop! Two people in particular jump out at me. Laurence Kirmayer has been a force in combining anthropology and psychiatry for years, and is one of the most creative thinkers in the broad arena of neuroanthropology. For example, in a 2006 article he discussed cultural biology, globalization and psychiatry; he also served as lead co-editor of the recent volume Understanding Trauma: Integrating Biological, Clinical and Cultural Perspectives. Cordelia Fine will also attend. Author of the book A Mind of Its Own (see this excerpt), Fine is both psychologist and journalist. She recently organized and edited a workshop on The Ethics of New Marketing, with proceedings published in Res Publica (including a nice piece by her on Vulnerable Minds? about marketing to children). Here’s a newspaper piece on Reversing the Forces of Habit, while Greg covered some of her work on neurosexism in March. Other presenters include Cornelius Borck, a philosopher and medical doctor, who examines the cultural history of electroencephalography and the impact of neuroscience on cultural constructions of body, mind and self, for example, this piece Vision Engineering on sensory aids and senses of self. Simon Cohn, a medical anthropologist, and Ian Gold, who works on philosophy and psychiatry, will also present. Gold and Kirmayer together wrote a good online essay on cultural psychiatry and brain (dys)function. And of course Suparna herself, who works on adolescent social cognition and critical neuroscience more broadly. Hope to get in touch with your group.